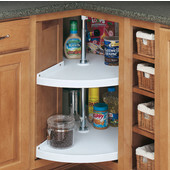 Cabinet Accessories Unlimited carries a large selection of high quality lazy susans and cabinet organization products by Hafele, Rev-a-Shelf, Knape & Vogt and more. 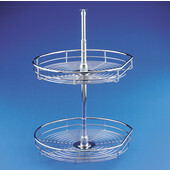 Choose from D-shaped, full round, half round, kidney shaped, pie cut lazy susans to fit your storage and organization needs. 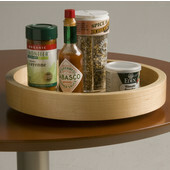 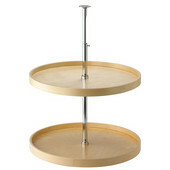 Lazy susans for the table tops and upper and wall cabinets are also available. 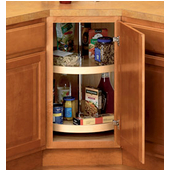 Knape & Vogt offers a vast collection of lazy susans and cabinet organizers in many material styles that include chrome wire and wood veneers. 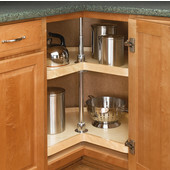 The susans are crafted to fit any cabinet and the high quality construction allows them to function with ease for years to come. 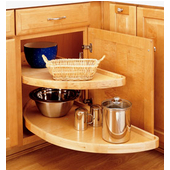 The lazy susans are available with multiple shelf options all the way up to six tiers for full sized pantry cabinets so there is something for every kitchen large or small.